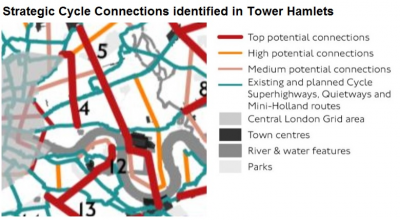 Transport for London has now published its Strategic Cycling Analysis, which identifies routes where there is a high potential for cycling. The analysis brings together an impressively wide range of data. It includes information about the trips Londoners currently make and what proportion of them could, in reality, easily be made by bicycle. It then combines this with other factors, including demographic data and likely areas of future increase in population or employment. Alternative routes to the towpath? Come to our September workshop. All users of the towpaths in the borough agree that at times the canals are victims of their own success; there are too many users! The Canal and River Trust are working on alternative routes to ease congestion and LCC borough groups are helping. Encouraged by a recent Hackney Cyclists' event, Tower Hamlets Wheelers and friends are holding a workshop with the C&R Trsut on ways of making routes near the Regents Canal attractive and safe for pedestrians and cyclists.